The main species of porcupine that is native to Alaska is the North American porcupine. These mammals are known for their barbed quills, which are used as a defense mechanism. They have a muscular tail which also aids in defense and climbing. Porcupines are primarily nocturnal but can be spotted during the day, mainly in the fall and spring seasons. Their habitats consist of forested areas and they dwell inside of natural cavities, like hollow logs or caves. Unfortunately, due to the threat of predators and an on slot of vehicle collisions, their need for rescue is crucial for their survival. What do I do if I find a baby porcupine? If you come across a baby porcupine, it is important to note that if the baby is too small to climb, the mother will often times leave them on the ground while they climb in search for food. If the baby has no obvious sign of injury, and you do not see the mother around, the baby is more than likely safe. Nonetheless, if you have any questions or concerns, please contact Alaska Wildlife Rescue. Are you near a road? Any dogs or predators nearby? What do I do if I find an injured porcupine? 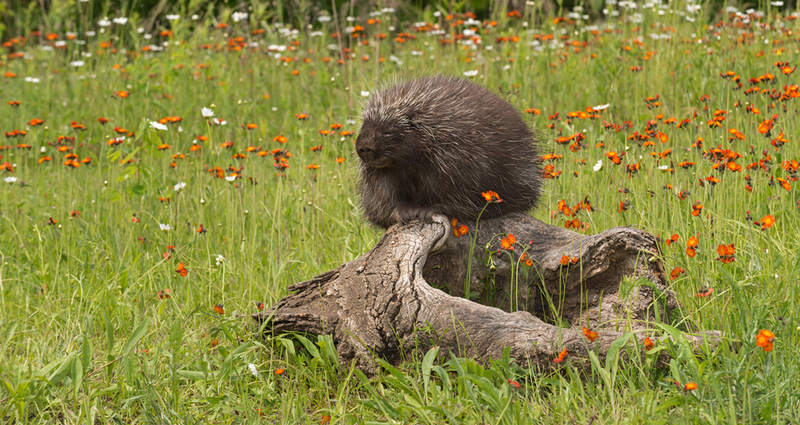 If you happen upon an injured porcupine, it is best to not try to capture or corner the animal. 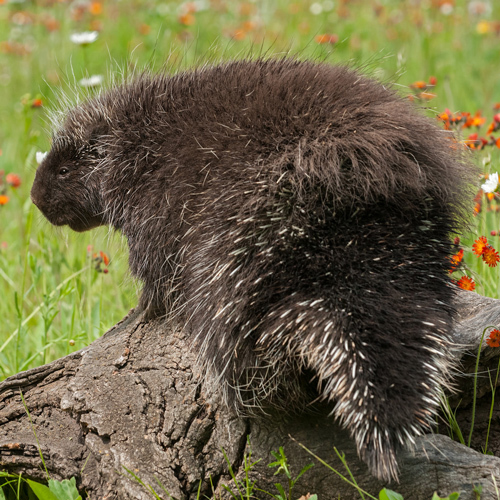 It is critical to remember that porcupines have over 30,000 quills and defend themselves by swinging their tails back and forth, and releasing the quills on impact. They are extremely painful to withdraw from the skin. For your safety and to prevent any further harm to the animal, keep your distance and look for any obvious sign of injury. For further assistance, please contact Alaska Wildlife Rescue, immediately. Is it near a road? How do I remove a porcupine from my yard? It is important to get rid of a porcupine as soon as possible to avoid confrontation with a pet or child. Due to the slow nature of their walk, family pets are bound to run into them and cause a quick and expensive trip to the local vet to remove quills from your pet’s face and neck. These quills are made up of hollow tubes with “barbs” constructed to the ends of each quill which make it very difficult and extremely painful to any soft tissue they embed themselves into. Varmint Gone Anchorage (https://anchorage.varmintgone.com) offers porcupine removal service throughout Anchorage and MatSu Valley regions.